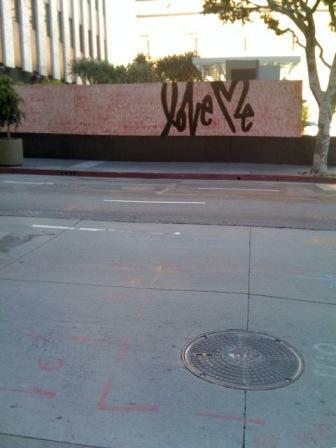 “Love Me” was here: Happy Valentine’s Day! The Standard Hotel’s latest mural installation is a lovely Valentine compliments of Graffiti Artist/Photographer Curtis Kulig. It made me smile when I saw it Monday, so I thought I’d share the love. I first saw it from a distance, but was pleasantly surprised to uncover more beneath the surface as I got up close to the piece. His “Love Me” tags can be found in N.Y. and Tokyo, on the street and on a hoodie/t-shirt near you, so if you’re lucky enough to spot one, scoop it up! Psst, his photography is very cool too. Here’s some footage of the work in process. Smooches!